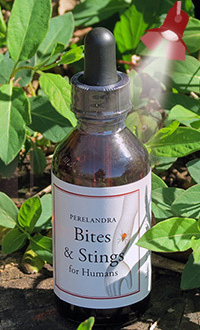 Spotlight: Bites & Stings - Perelandra Ltd. Whether you're already seeing gnat and mosquito clouds above your head at dusk, the overnight lows are still below freezing where you live or you're about to experience a spring snow storm, it's time to think about this. As temperatures go up, so will the local population of insects. With this increased insect activity comes an increase in irritating and sometimes serious challenges. Unless you live in a bubble, the uptick (pun intended!) of insect life will directly affect you. Now's your chance to "get out in front of it" for the coming season. 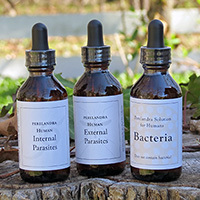 If you enjoy hiking, gardening, playing sports, biking, birdwatching, camping, walking the dog, walking to work or school, simply relaxing in your yard or anything else that takes you outside, add the support provided by Bites & Stings. The sooner you get started, the more effective it can be. You're the one that everyone likes to sit by at the family picnic because they know with you around, they won't have to worry about mosquitoes. When an insect does get you, your reaction seems like a larger-than-life caricature of what "normal" people experience. You volunteer at the local shelter and often head home wondering why you're now scratching like that dog you were just playing with. The Bites & Stings Solution is for humans only. It comes in a 2-oz. dropper bottle that yields around 150 doses, which will last one person approximately two months when taking it twice daily. It's most helpful to start taking Bites & Stings one month prior to insect season, but if the season has already begun in your area, that's okay. You can start anytime. Something else to consider . . .
Now we've got your brain gears turning! Biting and stinging insects carry and transmit bacteria. The Bacteria Solution pattern is working from the perspective of that group of microbes (hence the distinguishing "bacteria" in the name), enabling it to provide broad, unprecedented coverage.